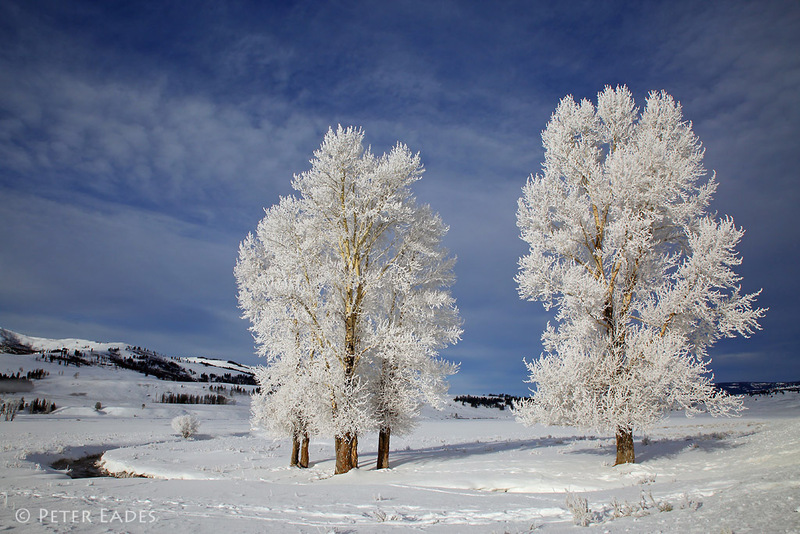 I ran my “Winter in Yellowstone” photo tour from February 6-13. I had a wonderful group again this year and I’d like to thank Art, Jamie, Sherrie, Peter, Edgar, and Debi for joining me. I very much enjoyed the time together. All the images shown in this post will be from them. Thank you for sharing! This winter like last years has been warmer and dryer than normal. During the tour temperatures where quite mild and snowpack was below normal. We never saw below zero temperatures the entire trip which is quite unusual for February in Yellowstone National Park. Our first 2 days were spent exploring the interior of Yellowstone in a chartered snowcoach. We departed daily from West Yellowstone. Morning one was cold, in single digits, with some frost. Ideal conditions for some great photography. We drove along the Madison River after leaving town. Over the past 4-5 years bobcats have been hunting the abundant waterfowl that winter along the river which doesn’t freeze over due to the influx of thermally heated water. All throughout January bobcats were being seen and photographed daily. During the past 3 years we’ve photographed bobcats on each of my winter tours. Unfortunately this year the bobcats vanished 4-5 days before the tour started. A good friend of mine and professional videographer, working on a Yellowstone documentary for the BBC provided me with some great information. He has been filming the bobcats for a month with great success. He told me that he’d filmed 5 different bobcats along the Madison this winter. We speculated on why the bobcats vanished and came up with 2 theories. One is it has something to do with the breeding season and the other is that the snowpack is low and crusted allowing the bobcats to hunt there usual prey such as rabbits, squirrels and grouse in the forests easily. Hunting waterfowl is not ideal for bobcats. I tend to think theory 2 is correct. We searched very hard for 2 days without a bobcat sighting. As always in Yellowstone National Park there is always something of interest to photograph. 2016 was no exception. 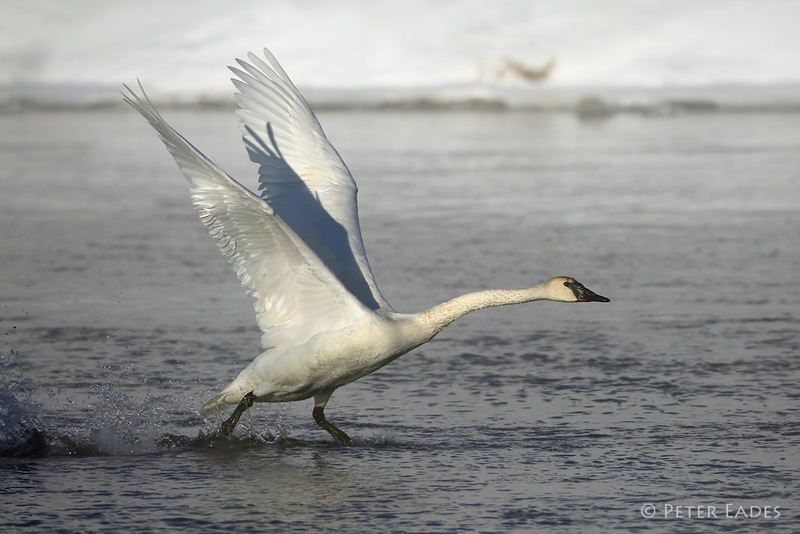 This was one of the best years I’ve seen for photographing trumpeter swans along the Madison and Firehole Rivers. We had a number of great photo opportunities with these magnificent birds including some great take off and birds in flight chances. I think everyone on the tour was able to capture some great images. 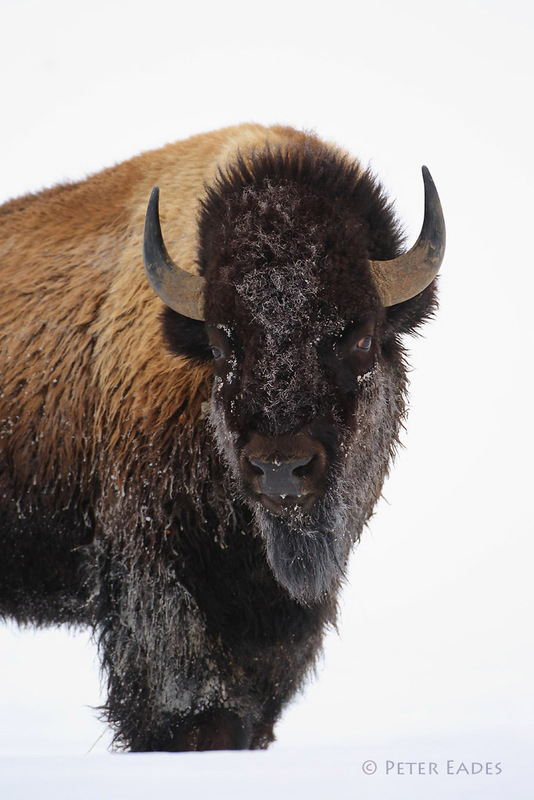 During our time in the interior we saw a number of red fox, coyote, elk, and bison and visited the thermal areas. All in all is was a successful couple of days. We had wonderful light for Old Faithful and captured a fine eruption. Thermal areas are much better on sunny days for photography. The steam contrasts dramatically against blue skies. We then transferred to the northern portion of Yellowstone for the remainder of the tour. The northern range of the park has the largest concentration of animals during the winter and is prime viewing area for the parks wolf packs. 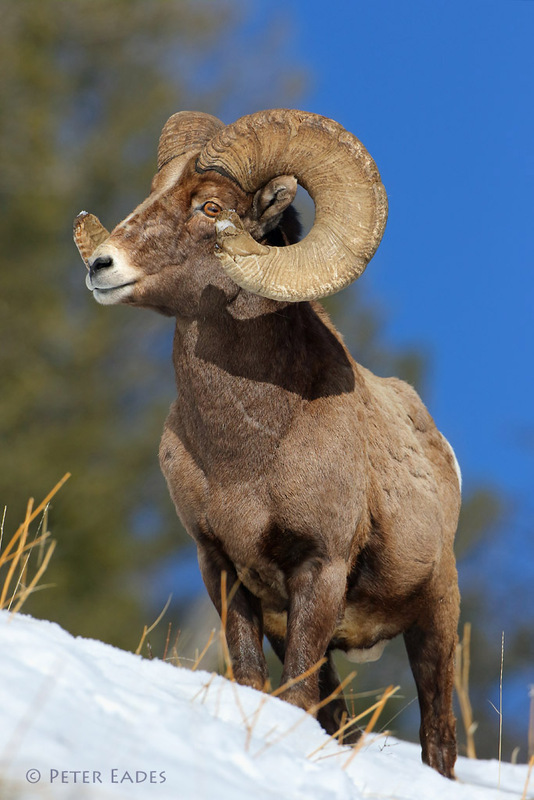 From our base in Gardiner Montana we have 55 miles of accessible roads to travel searching for wildlife and landscape images. 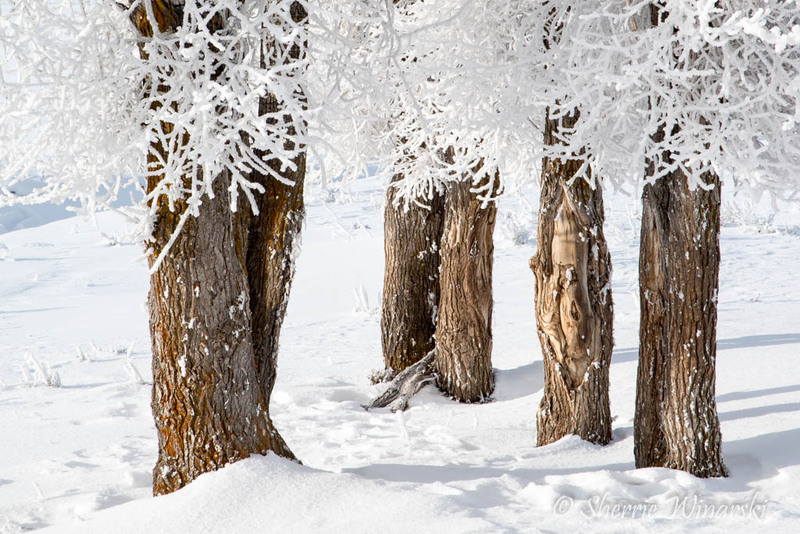 On several mornings we had very frosty conditions that made for some great landscape images in the Lamar Valley. During our time in the northern part of the park we coyotes, wolves, red fox, bighorn sheep and bison were all observed and photographed. We had a real nice chance to photograph the Junction Butte Peak wolf pack early one morning and were serenaded by their haunting howls. 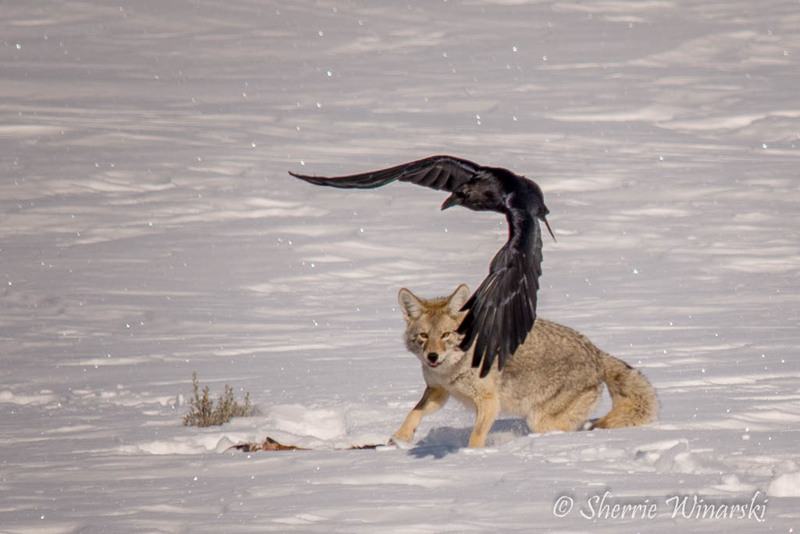 We also photographed individual wolves the Lamar Canyon wolf pack on several occasions. The Prospect Peak pack was visible from Blacktail Creek but too distant for photography. 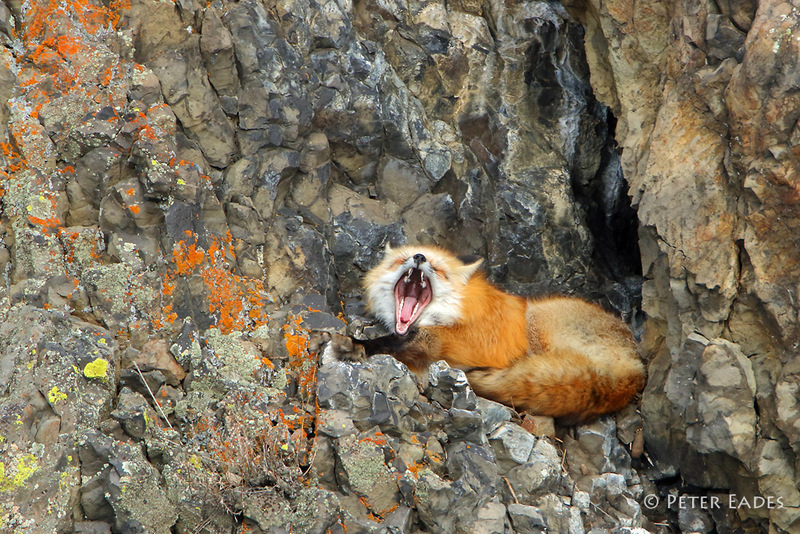 On our final afternoon we located a beautiful red fox resting in a crevasse in a colorful lichen covered rock outcrop near the Yellowstone River not far from Tower Junction. It was a outstanding photo opportunity and we spent the entire afternoon there. Everyone came away with some dramatic and artistic images. 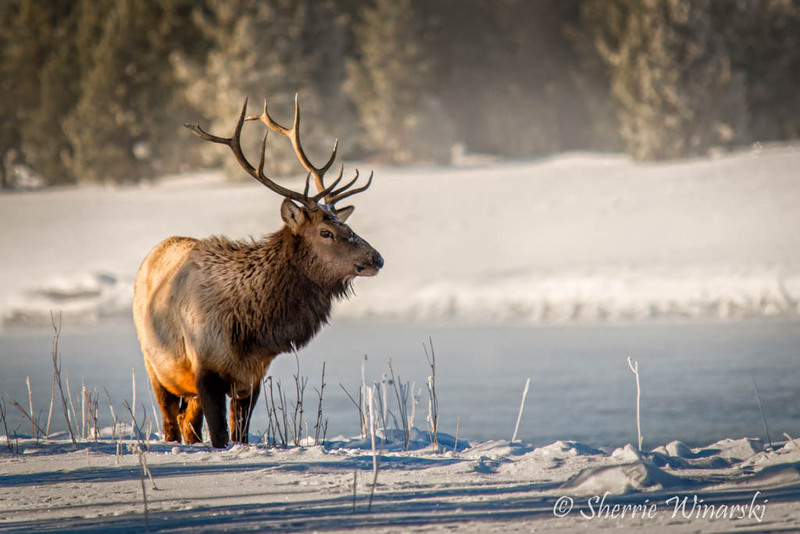 Every winter in Yellowstone is unique and interesting. 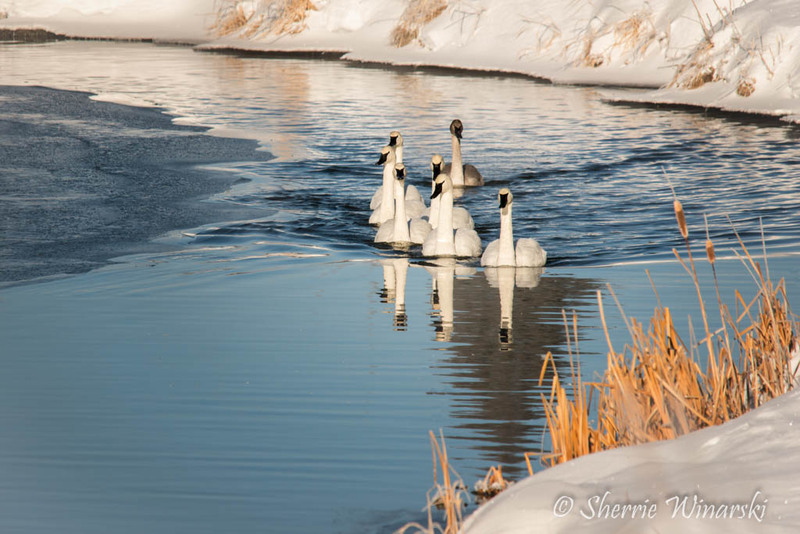 I’m offering two tours in 2017 and I’m already looking forward to them.. Again thanks Peter and Sherrie for allowing me to post your great images.